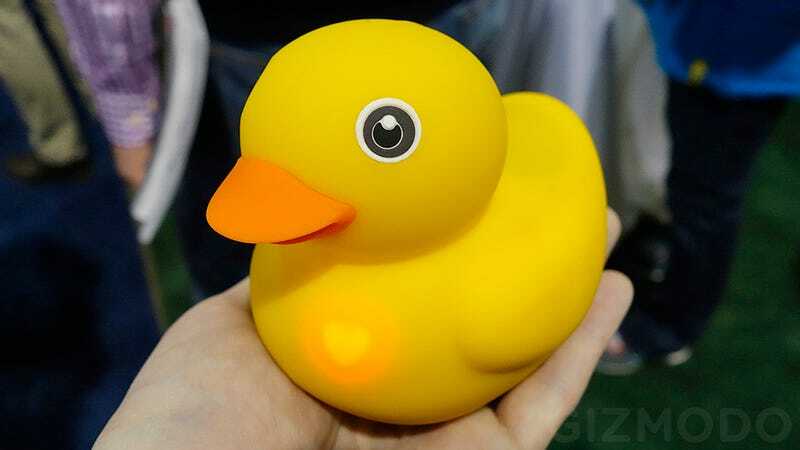 Before you roll your eyes at yet another smart device that didn't really need a smart upgrade, Edwin might convince you that the world is actually a better place with a smart rubber duckie in it. With a Bluetooth connection to your phone and an internal temperature sensor it can alert parents when the temperature of bath water gets too hot for kids. And there's a waterproof speaker hiding inside as well so your keep can keep on Raffi-ing even during a bath. At night Edwin recharges on its own included dock on your child's nightstand, doubling as a soft glowing LED nightlight that can be tinted to almost any color. And while connected to an iOS or Android smartphone or tablet, there are even books that Edwin can read along with, and games that he can interact with. What truly sets Edwin apart from other interactive toys is his the Edwin App, compatible with iOS, Android, and Windows devices, which is key to bringing Edwin's world to life. pi lab works with world-renowned educators, musicians and cognitive specialists to make sure each child gets the most rewarding experiences. The Edwin App is comprised of four key areas: Story Time, Sleepy Time, Play Time and Bath Time. Story Time includes original animated adventure stories that bring important childhood lessons to life, emphasizing self-confidence, good decision-making, health, and other important topics. Edwin the toy will engage with families as they read each story, quacking and lighting up along the way. At bedtime, Edwin's LED light can change to almost any color, adjustable inside the app. Edwin's lullabies are exclusively developed, and a white noise machine can help block outside noise. At play time, Edwin will teach the basics of letters, numbers, shapes and colors, and his library of educational content will grow to include many more modules for children of all ages, cultures, and skill levels. Finally at bath time, Edwin will make sure the water is just the right temperature with his onboard thermometer, play custom written bath time tunes, or choose songs from their own playlist.